A successful woman who feels our city leads from the front. Once upon a time, Pretoria businesswoman Dr Anna Mokgokong and I were schoolgirls in Swaziland where both our fathers were teachers. We didn't know each other back then but this coincidence came to light when we met at her beautiful home in Waterkloof Ridge for breakfast last week. The story tells a little about Dr Anna, as she likes to be called. She is grateful to her late parents for schooling her in Swaziland rather than apartheid South Africa, and while they may not have had much, they made sacrifices so that she and her siblings had the best possible education. It also reflects how personable she is and that, despite her enormous success and busy schedule, she likes to invite people to her home and get to know them too. It was as a schoolgirl that Mokgokong had her first stirrings of entrepreneurship, revealing that she would sell sandwiches to her peers on the playground to make money to buy herself treats. While at Medunsa, where she qualified as a doctor, she sold handbags to fellow students to make the money she required and she opened a boutique before combining her medical and business knowledge to launch her first venture linked to her field of study; a medical centre near GaRankuwa where close to 40 000 patients received treatment. But it was the decision, with Joe Madungandaba as her partner, in 1995 to form the 100% black-owned Community Investment Holdings (CIH), which really saw her success take off. Today this leading BEE company has interests in health care, technology, property, mining, power and energy and logistics and Mokgokong is a very wealthy woman who has won many awards. "We are partnering with international players who have the technology and funding," says Mokgokong, "and we are working to make a difference in South Africa". "We've submitted our licence application with Nersa to develop a regasification plant at Coega," she explains. "This is a massive infrastructure project that can be catalytic to economic development, job creation and SMME development in a needy province. about the bright future of business in South Africa. "For once people can seek employment in their own home towns and alleviate migrant labour practices. "This will open up importation of much-needed gas resources that can develop and create diversification of energy sources. "A country cannot depend on one source of a strategic resource like energy, you have to diversify" she says, and she is excited by the possibilities gas offers. "We are building infrastructure (at Coega) but it is not only for us; other entities can use the resource." Mokgokong, who has been a regular guest in the US and other countries, says business has to get out and talk about South Africa because, despite the doomsayers, there is "great interest" in South Africa and "international players have technology and funding they are willing to invest in this country". Of a recent trip to the US, she said she met high-profile business people with an interest and confidence in investing in South Africa. "I was at a breakfast, sitting next to the chairman of Microsoft," she says of her latest trip. She mentioned a project she was involved in and there and then he offered to provide the necessary technology. There are challenges to doing business in South Africa, however, and investors want to meet those like Mokgokong who can open doors and help them navigate these. Asked what these challenges are, Mokgokong said while policies were good "we take too long to get things done in South Africa"... and "we can be too negative". "One of the problems is bureaucracy that ties our hands and even our minds. I sit on five JSE companies and we are bound by many rules. But, nowhere does it say you need three years to take a decision." She also believes we need to be much more flexible and less fearful of failure, relating a meeting with Korean partners where issues were dealt with promptly and positively in a single meeting "even leaving us time to go for dinner". Another frustration for Mokgokong is the gap between the public and private sectors. "Once a year we (business) meet the president but what we need is a seamless integration of them (government) and us." She cites the example of the NHI in the UK which had a backlog of cataract operations. They put out a tender, won by Netcare, and a team of specialists went and did 40000 operations. "Why not do that here; we are all South Africans, and we need to work together to solve our problems." Paying it forward is also a motto she subscribes to. She's seen how in Italy, in the fashion business, partnerships between large corporates and smaller partners such as family businesses make a difference. In the agricultural sector, big successful commercial farmers should, as part of enterprise development, take on the role of mentoring smaller farmers and ensuring their success. 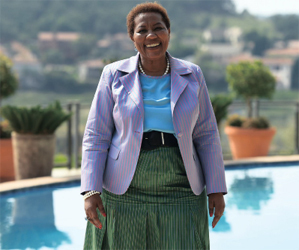 Mokgokong has a particular passion for Tshwane, the city she describes as "progressive". "We are fortunate in Tshwane to have a dynamic and visionary mayor (Kgosientso Ramokgopa)," she says, citing initiatives such as the free wi-fi project. "In South Africa, we need to have leaders who are progressive and fearless", she said. Mokgokong wants to be part of redefining the city and spearheads a consortium which is to invest in the redevelopment of the western part of the city - West Capital - including the dilapidated Schubart Park flats. To achieve this she has looked at models overseas for guidance on the type of accommodation and faculties which should be provided. She believes the bold development the city is seeing, and its role as a capital, mean it will be totally unrecognisable in a decade or two. But for her, more needs to be done especially to promote the township economy One idea is to set up a giant kitchen where women from the township can, for example, produce goods in a controlled environment, which can be packaged and sold to retailers. "People can have the best idea or skill, but need an outlet, and that's what we can provide." "What for me is important coming out of the Mayor's State of the Capital Address (on April 21), is what are the opportunities; the plans for economic development, especially of the townships. Her message to city residents: Have "an attitude of comradeship". Citing herself, she says "you cannot live up here on the hill and not care what is going on below We all belong to one city and we need to co-exist in an inclusive and positive way"